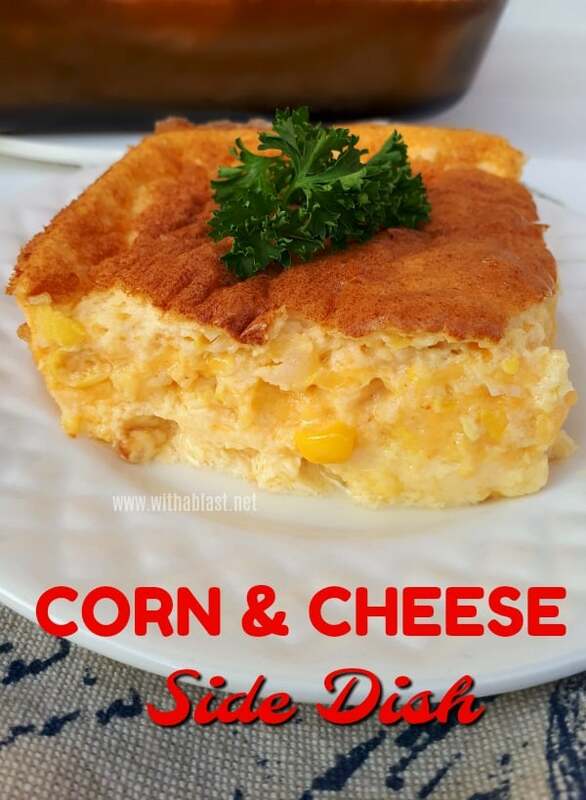 This Corn and Cheese side dish is extremely popular and everyone always wants second helpings. The cheese blends in amazingly with the rest of the ingredients and most people would not even realize that cheese is really the main ingredient here. But once a bite is taken, a heavenly taste of cheese bursts in your mouth with a hint of the corn. This is another one of those dishes which puffs up so nicely and as soon as it is removed from the oven it deflates. Not that it does anything to the flavor though! Fluffy, soft and delicious ! The texture is something between a souffle and a mousse, but if you leave the dish standing too long after baking, it will harden up a bit, which is also very tasty, but I like the just out of the oven version better. 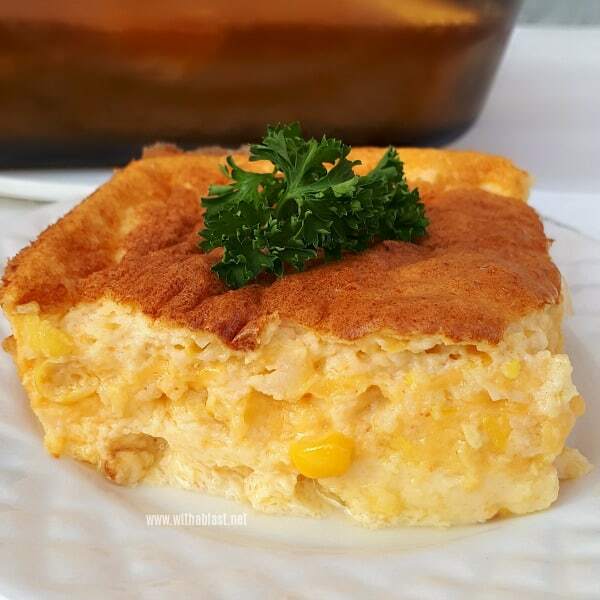 The Corn and Cheese side dish is the perfect accompaniment to any Sunday roast and I normally stick it into the oven, with the roast, about 50 minutes or so before my roasts’ baking time is over. That way both dishes, the roast and the side dish, can stand just long enough to settle and be served at the same time. 1.) Pre-heat the oven to 180 deg C (350 deg F) – Spray a 20 x 20cm (8 x 8 inch) oven dish with cooking oil. 2.) Heat the Milk and Butter in a small saucepan until it reaches boiling point – remove from heat – add the Corn, Cheddar, Bread Crumbs, Salt, Cayenne Pepper and the Egg Yolks – stir and mix well. 3.) 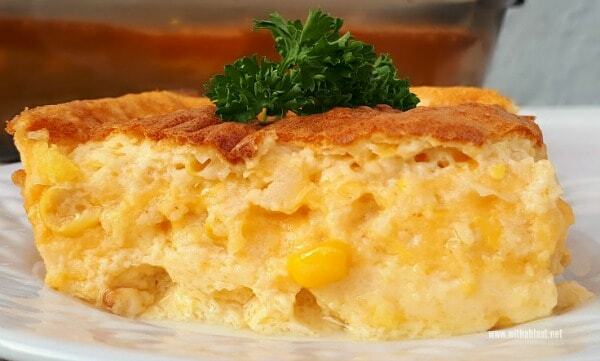 Beat the Egg Whites until stiff – gently fold into the Corn mixture – transfer to the prepared oven dish. 4.) Bake 45 minutes until puffed and golden brown. Remove from the oven – let stand for 5 minutes and serve! I am going to a family get together soon and will be making this dish to take. 🙂 We are having ham, chicken and dumplings and greenbean casserole there, along with peanut butter pie and multitudes of other delicious dishes…I'm sure this will be a huge hit. Thanks! Please add me to your e-mail postings! Thanks. 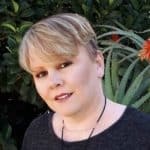 Added you to our mailing list, Tammy 🙂 Thank you and enjoy the posts !